Last weekend the Beers Made By Walking Festival showcased 40 hike-inspired beers during the Great American Beer Festival. If you missed that event, or if you just can't get enough of these unique beers, we invite you to two small tapping events in the coming weeks that will feature beers made with the Colorado landscape in mind. The two events take place on Colorado’s Front Range, in Longmont and Fort Collins. 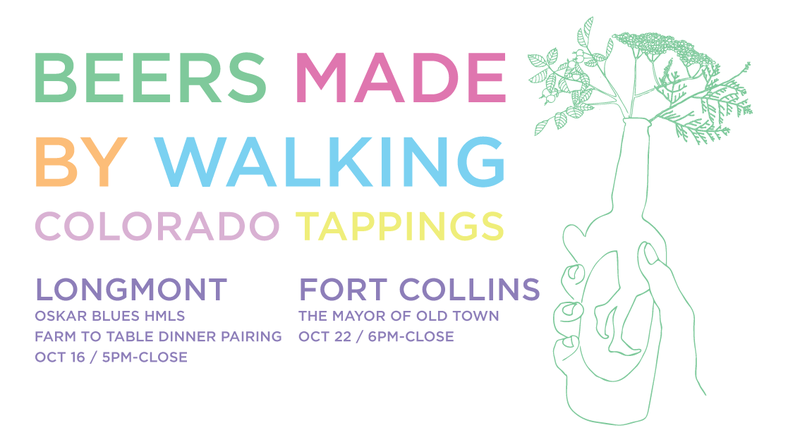 Oskar Blues Home Made Liquids and Solids /// 1555 S Hover St.On Thursday, October 16th, Oskar Blues Home Made Liquids and Solids (HMLS) in Longmont will pour four different beers made from the Beers Made By Walking program. Breweries represented will be Oskar Blues, Horse & Dragon, Bonfire, and Pateros Creek. Guests can buy these beers by the pint, or they can have them paired with a special farm to table dinner that will accompany the full menu at HMLS. The dinner specials begin at 5pm and beers will be sold until they sell out. The Mayor of Old Town /// 632 S Mason St.
Fort Collins will see a small handful of Beers Made By Walking beers at the famous beer bar, The Mayor of Old Town. We invite our friends in Fort Collins to taste truly local flavors from Horse & Dragon, Pateros Creek, and Oskar Blues. Beers will be poured at The Mayor until they run out.